147 x 105 mm. – 188 leaves, with 5 full-page (and 1 smaller) miniatures, 8 large initials in blue or purple on a gold field. Made c. 1486, presumably in Cologne, for a man and written in the vernacular with local saints highlighted in red, the codicological, linguistic, and textual characteristics of this prayerbook suggest that the manuscript was made in the Netherlandish-German border area of the Lower Rhine. This manuscript's script, the littera hybrida is a mixture of scripts, combining features of both littera textualis and littera cursive, with a ‘simple’ a and with descending hastes of f and long s, and with straight hastes of b, h, k and l. This script grew to be the ‘national’ script of the Low Countries, where it became most common for books in the circles of the Devotio Moderna (except for liturgical books). This reform movement, which had spread from Deventer since the early 15th century, also influenced texts to a large extent. Their devotees' prayers often ended with a confession of trust in God the Father, Christ, Mary, or a choice of saints and then expressed his or her personal piety. For them, all earthly afflictions were tolerable if only they would lead to eternal glory in heaven. Manuscripts of this type are thus a kind of personal creed, shown here in the ‘ich’ and ‘mijnre’, ‘voir ons’, ‘wir’. The recurrence of male forms suggesting the book was made for a man. Ideas, usages and texts promoted by the Modern Devotionalists were dispersed via the Congregation of Windesheim – a form of centralized government under a prior general. In Cologne specifically, the Augustinian Canons of the monastery of Herrenleichnam belonged to the Congregation of Windesheim since the middle of the 15th century, and, at the same time, the Fraterhaus of St. Michael zum Weidenbach was a foundation influenced directly by the Brothers of the Common Life in Deventer and Münster. Both houses were involved in manuscript production. 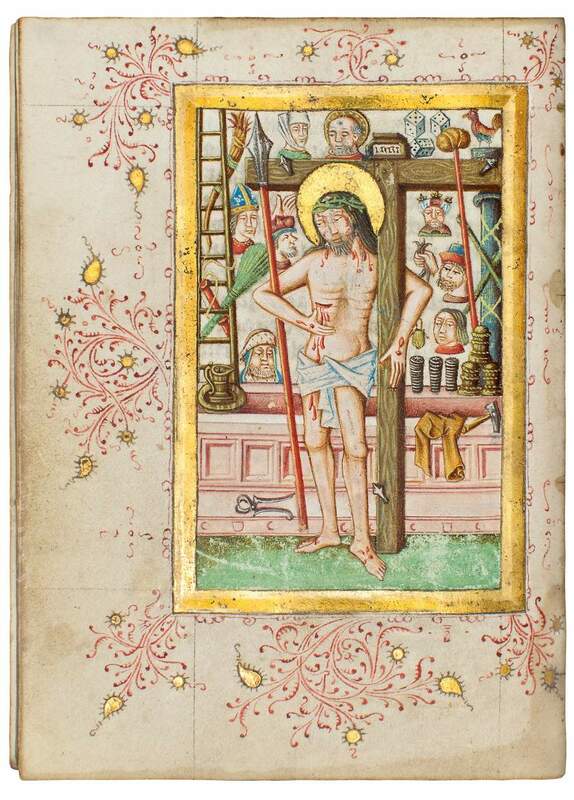 This manuscript's high quality miniatures are executed by two accomplished artists.